Take your best shot! The choice is yours. 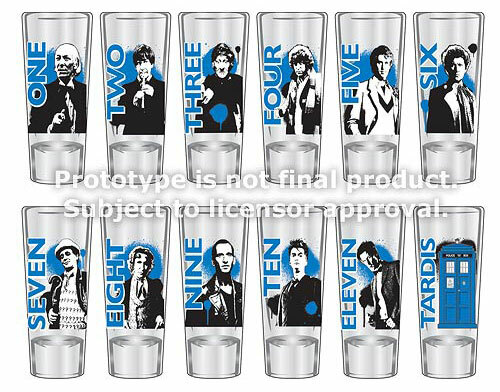 When you order this 12-pack of 2-ounce shot glasses based on the BBC’s Doctor Who television series, you get quality glassware featuring the show’s logo and blue-and-black images of all 11 Doctors (one Doctor image per glass) and the TARDIS! You can drink with a different Doctor every day! Produced by the BBC, Doctor Who is the longest-running sci-fi TV series in the world. The award-winning show presents the adventures of a time traveler known simply as “the Doctor.” Along with his companions, this mysterious Time Lord journeys through time and space using his TARDIS, which appears from the outside to be an ordinary police phone booth. What more could you ask for? 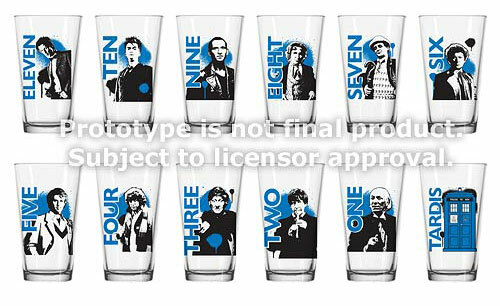 When you order this 12-pack of 16-ounce pint drinking glasses based on the BBC’s Doctor Who television series, you get quality glassware featuring the show’s logo and blue-and-black images of all 11 Doctors (one Doctor image per glass) and the TARDIS! You can drink with a different Doctor every day! The perfect present for my Doctor Who obsessed mom… FINALLY!! FINALLY, some good 50th anniversary kitchenware ! Nice. Do we know how much each set will be?